On the way back to Moab from California, we searched online for the closest Cummins Repair Shop in hopes that we could get our overheating engine problem remedied. 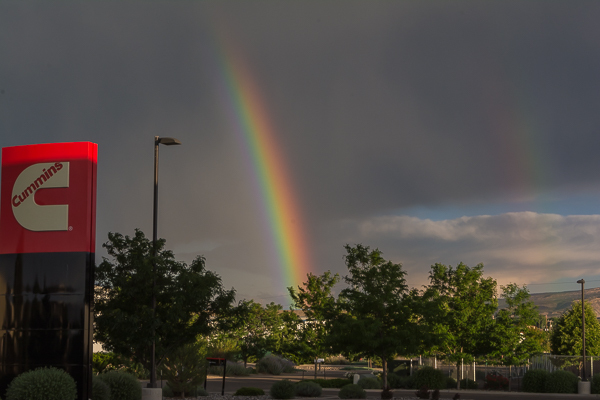 We found just such a shop in Grand Junction Colorado and since that was in the direction that we wanted to go after leaving Moab, we made an appointment to have our cooling system checked the following week. Jim predicted that we would love this town as it has all the shopping that we were used to in NC without any of the traffic. He was so right about that and when you throw in the thriving downtown, many parks and numerous wineries we were thrilled that we added this town to our travels. While our coach was in the shop for the first round of repairs (the bad and costly part), we were able to dry camp in their parking lot (they did have 50 amp service – no water or sewer though) so at least that was free if you don’t figure in the repair costs 🙂 After 2 days of working, they fixed a ride quality problem we had developed after Storm replaced the bushings on our sway bar (he did not have tools to adjust), but the engine continued to overheat on hills. So $1000 and 3 days of downtime later, we were stranded in Grand Junstion until Monday when they could work on it again. 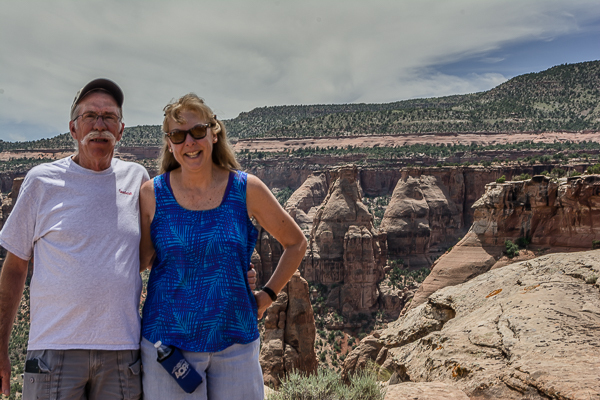 We tried to make the best of things by visiting as many local attractions as possible including taking a couple of rides through the Colorado National Monument, hiking the Trail Through Time, driving up to Grand Mesa, picnicing at Vega Lake and visiting local wineries. Several of the wineries were located in the same facility so all we had to do was stagger from one tasting room to another – an added convenience. We spent one evening researching our heat problem and learned that replacing the radiator cap and thermostat might help so we picked up parts to have ready Monday hoping we could hit the road headed north before Tuesday. I am just glad we have friends like you to help us out when we get stumped on things like this! Well, did you actually get the cooling problem resolved? I have a couple more posts on this saga, but in the end we did get the problem moderated. Fixed might be too strong a word. We learned that the radiator Freightliner used on this Chassis (for several models of motorhomes not just CC), is a 1050 square inch radiator which is not very much cooling area. It seems that with this chassis it is best to take care when pulling long high grades, use the transmission to cool the engine, high RPM which yeilds lower torque, more water flow thru the radiator and cooler engine temp, drive in cooler temps and keep an eye on it. Over both passes going to Denver, the temp crept up but stayed well within operating range so we feel like we are OK now. Opportunity missed? You were only 75 miles from the Black Canyon of the Gunnison NP. If you didn’t take it in while in Grand Junction maybe you can add it to your itinerary on the way to Rapid City. We will have to add to our next trip through there. The one day we ventured 50 miles away the shop needed us to help find parts and we were in a bad cell area. Very stressful for Storm as delay in repair was a big concern (we were scheduled to meet my family in SD in a few days) so after that we stayed close to be in cell phone range.